BREVARD COUNTY, Florida - The Economic Development Commission of Florida's Space Coast is remaining silent after repeated requests from Brevard Times for an explanation of two identical confidentiality agreements with BlueWare that have different signature dates - hard evidence which proves that BlueWare and the EDC engaged in the falsification of at least one of those public documents. Florida statutes allow a company applying for economic development incentives to request an exemption from Florida's broad Public Records Law for one year through a confidentiality agreement with an economic development agency. That exemption can be extended for another year if the company requests an extension prior to the expiration of the original agreement. An 'original' confidentiality agreement dated January 31, 2012, along with an extension request dated January 11, 2013, were the key documents that the EDC relied upon when denying a public records request from Clerk of Court, Scott Ellis, that ultimately sparked a three-year court battle and cost taxpayers hundreds of thousands of dollars. 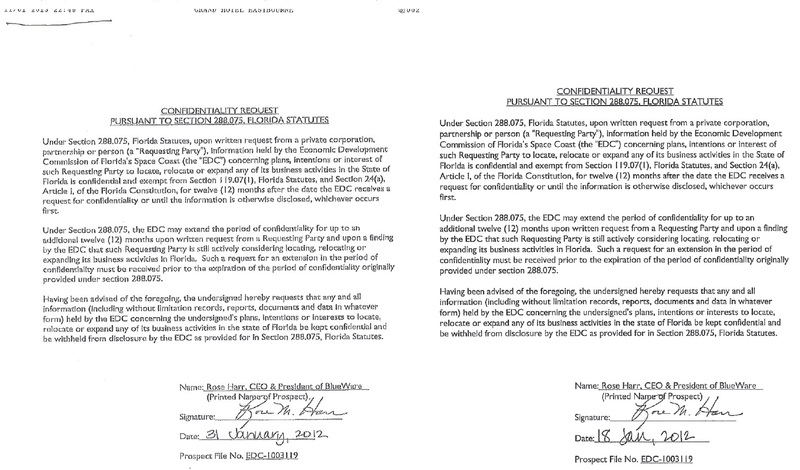 For those three years, Ellis maintained that after a visit to the EDC's office by his staff requesting the BlueWare documents on January 10, 2013, the EDC then provided a blank confidentiality agreement to BlueWare president Rose Harr, which she back-dated and faxed from a hotel room in England to the EDC on January 11, 2013. The discovery of a second 'original' confidentiality agreement dated January 18, 2012, now supports Ellis' contention that the January 31st confidentiality agreement was backdated because only one 'original' confidentiality agreement can be genuine while the other falsified. Under Florida law, falsification of a public record is a first-degree misdemeanor. Ellis also believes that the confidentiality agreement dated January 18, 2012, is falsified. He thinks that the January 18th document was backdated and sent by BlueWare to the EDC in response to a January 17, 2013, email sent by EDC President, Lynda Weatherman, who was apparently unaware of the January 31st-dated confidentiality agreement faxed on January 11, instructing her staff to ask BlueWare to request an extension without " ... looking like we are "asking for it" just the usual stuff..."
1/10/2013 – Ellis' staff visits the EDC office and requests to see the BlueWare file. The EDC claims that a confidentiality agreement with BlueWare exists and does not expire until January 31, 2013. However, the EDC does not show the Clerk's staff the confidentiality agreement. 1/11/2013 – The EDC receives two documents by facsimile from BlueWare CEO, Rose Harr. One is a confidentiality request form signed by Harr dated January 31, 2012. The second is a letter requesting a 12-month extension to the 'original' confidentiality agreement dated January 31st. The top banner indicates that the facsimile originated at Grand Hotel Eastbourne - a hotel in England. 1/17/2013 at 4:59 p.m. – The Clerk's office sent a formal public records request to the EDC for the BlueWare file by email. 1/17/2013 at 5:57 p.m. – Weatherman instructs staff in an email "to request an extension without " ... looking like we are "asking for it" [from BlueWare] just the usual stuff..."
1/24/2013 – Legal counsel for the EDC writes to the Clerk's office that the BlueWare documents are not subject to a public records request based up on the January 31st confidentiality agreement. 2/1/2013 – Ellis returns to the EDC to request the BlueWare file because the 'original' 12-month non-disclosure agreement ended on January 31. The EDC tells Ellis that the file was under a 12-month confidentiality extension and then presented Ellis with the two documents that had been faxed from England. 2/5/2013 - Ellis is quoted in a Brevard Times article accusing the EDC and BlueWare of backdating the confidentiality agreement. 8/15/2013 - Former Brevard County Clerk of Court, Mitch Needelman, and business partner, Matt Dupree, are arrested. An arrest warrant is issued for BlueWare CEO, Rose Harr. 8/20/13 - The Brevard County Commission orders the EDC to hand over the BlueWare documents. 8/26/13 - A Brevard Times investigation discovered that BlueWare confidentiality agreement with the State of Florida was terminated on April 5, 2013, and that the BlueWare documents were considered available for public records request. 8/27/13 - Upon learning the State's position on BlueWare's confidentiality from the Brevard Times article, Ellis sent his staff to the EDC again to request the BlueWare documents based upon the State's position. The EDC again refused to produce the BlueWare documents despite the State's position that confidentiality had lapsed. 8/29/13 - The EDC files a lawsuit for a Court declaration to determine whether or not BlueWare's documents are confidential. The EDC attaches a copy of the 'original' confidentiality agreement dated January 31 as Exhibit "A" to the EDC's petition.